A vast castellated edifice festooned with grotesque carvings, perched high atop a hillside overlooking the Shibden Valley, High Sunderland must have been an imposing sight. It was surely one of the most remarkable buildings in Calderdale. Descriptions and surviving photographs of the hall make it seem the very epitome of the Gothic mansion so it is hardly a surprise that ghost stories attached themselves to such a place. Indeed, every rambling pile in the valley has probably had a good haunting attached to it at some stage in its history. But aside from the idiosyncrasy of the building itself, High Sunderland and its spectre are significant in having most likely been the inspiration for not only the eponymous dwelling in Emily Brontë’s Wuthering Heights but also one of the most memorable episodes in the novel (a degree of verisimilitude entirely lacked by the better-known candidate, Top Withens). A house is first recorded at High Sunderland in 1274 and the Sunderland family not long after that. The elaborate façade which so dominated the valley was probably an older medieval timber-framed structure encased in stone, completed in either 1587 for Richard Sunderland or in 1629 for his grandson Abraham. This building was justly famed for its crenellations and ornately carved stonework, including a veritable bestiary of grotesques and numerous Latin inscriptions. One such engraving over the south door bore the legend, “This place hates negligence, loves peace, punishes crimes, observes laws, honours virtuous persons”; whilst another over a window on the south front read “May the Almighty grant that the lineage of Sunderland may quietly inhabit this seat, and maintain the rights of their ancestors free from strife until an ant drink up the waters of the sea, and a tortoise walk around the whole world”. Despite such entreaties, the history of the hall was not a particularly happy one. It slipped from possession of the Sunderland family in 1646 during the Civil Wars when the Parliamentary forces imposed a decimation tax on Langdale Sunderland for his role fighting for the Royalists as Captain of a Troop of Horse under the Earl of Newcastle, forcing him to sell the family estates. Over the centuries it passed through a succession of owners and by the early 20th Century it had been divided into separate tenements. During the 1940s mining activity in the area caused substantial subsidence and the house was declared unsafe. The owner at the time attempted to sell it to both the Halifax Corporation and the Bronte Society, but the cost of repair was estimated to be greater than the value of the property itself and so it was demolished in 1951, a sad end for such a singular and significant building. High Sunderland’s Wuthering Heights connection dates to 1838, when Emily Brontë found work as a teacher at Law Hill School in Southowram, little over a mile from where High Sunderland stood. Although Emily’s time at Law Hill was not a happy one, it seems she was fond of the landscape – which had much in common with her beloved Haworth – and would often ride around the district, making it certain that High Sunderland was known to her. In the opening chapter of her famous novel, when Mr. Lockwood first approaches Wuthering Heights, he observes “a quantity of grotesque carvings lavished over the front…a wilderness of crumbling griffins and shameless little boys above the principal door,” a description which perfectly corresponds to the doorway at High Sunderland. It has also been ascertained that the floor-plan of the building had much in common with Brontë’s portrayal of the interior layout of Wuthering Heights. If the correspondence between the floor plan of the real and imaginary building was indeed more than a coincidence that suggests Emily must have been a guest at High Sunderland on at least one occasion. Doubtless on just such a visit she would’ve been regaled with the ghost story, later recorded by R. Thurston Hopkins in his 1953 volume, Ghosts Over England. It tells how anybody sleeping in a certain room in the hall would awake in the dead of night to hear footsteps along the corridor outside and a fumbling at the door. Once the door had proved secure, the rattle of the handle would be followed some moments later by a tap at the window and if a person was brave enough to look out, they would see a disembodied hand rap against the glass several times before a peal of hideous laughter was heard. It was said the hand had once belonged to an “estimable and virtuous lady” unjustly accused of infidelity by her husband, who had then cut off the appendage in a fit of jealousy. The fields and lanes in the vicinity of High Sunderland in the hours around midnight were also reputed to be the haunt of a phantom white horse. A reference to this in the Evening Courier in April 1973, along with speculation that the apparition was largely folkloric and had not been seen by anybody in living memory, prompted a response from a Robert Whitehead of Illingworth who believed that he and his wife might have witnessed it twenty years previously when they had been walking home one night along Claremount Road towards Godley Bridge. He claims they saw a white horse running down the middle of the road and fearing that it could prove a danger to traffic, contacted the police. However, despite the squad car taking little time to arrive and proceeding to conduct a thorough search of the surrounding streets, Mr. Whitehead recalls that the horse was never found, having apparently vanished into thin air. 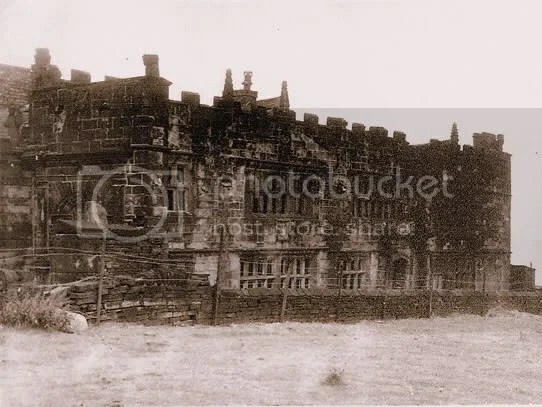 I once visited High Sunderland Hall,I was probably 14 or 15 yrs old.I did not venture passed the barb wire,I was too scared,a very creepy place. How unbelievably sad that such a fantastic building should have been allowed to fall into disrepair and finally demolished. I visited the site in 1985, and learned that some pieces of stone carving from the Hall were located at a museum of sorts nearby, I don’t recall the location though. Yes, several can still be seen at Shibden Hall which is just a mile or so away. My wife is a descendant of the Sunderlands of High Sunderland and Coley Hall. Are you related William? Yes, according to a geneology book called “The Maryland Line of the Sunderland Family” written by my grandmother (“Mrs. Glenn H. Sunderland”), which I have seen referenced in a few posts on geneology sites. Your house sounds fascinating! I have a fairly extensive family tree of the Sunderlands (of Coley Hall and High Sunderland) but I don’t have a Phyllis on it. I know that there were (are) lots of Sunderland families hailing from Halifax and surrounds and maybe they did all descend from the same source many centuries ago… but the links are lost in the mists of time! We have 3 pen and ink drawings of High Sunderland made by my wife’s great aunt Olive Sunderland (who moved to South Africa where she became a quite well known artist) – but I don’t know how to post them on this thread (help!?). When I started doing genealogy my grandmother told me that our family had once owned High Sunderland. We even have a copy of the Sunderland family crest. While researching my family tree, i came across a distant ancestor noted on a census as living at High Sunderland in the 1840’s, the Gregson family. Lewis Gregson went onto marry a great aunt ( who had previously been married to my great uncle John Parkinson here in Halifax uk…) and had moved to Boston Mass USA. Lewis married Isabella Parkinson nee Smith and i have an original letter from isabella from 1869!